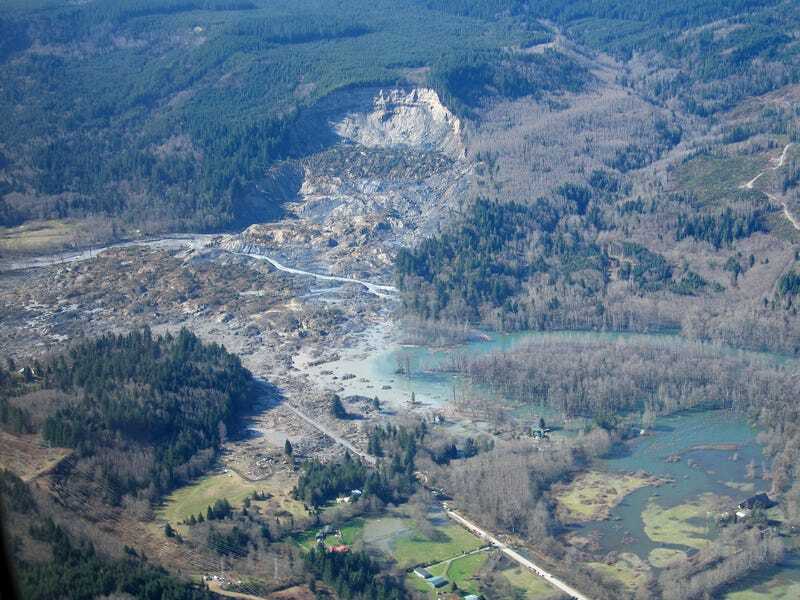 The landslide in March of this year that buried the community of Oso, Washington killed 43 people. That makes it the deadliest landslide in American history, and yet it happened in almost totally unremarkable circumstances. So, what happened and can we do to reduce the risk of future landslides? After the search and rescue efforts and recovery operations concluded, the Geotechnical Extreme Events Reconnaissance Association (GEER) sent out a rapid response investigation team funded by the National Science Foundation. A week of fieldwork and two months of analysis later, they've published their initial findings on what happened and what lessons we can learn from the deadliest landslide in American history. The Oso Landslide happened in a valley with a long history of historic and prehistoric landslides, some even in the not-so-distant past. The 2014 landslide was actually in the exact location of the 2006 Hazel Landslide, reactivating that smaller disaster. The recent colossal landslide ran out down the slope, across the river, and into the town, entraining older debris and riverwater into the flow. While the volume of the deadly landslide makes it a rare event, the GEER report fascinatingly concludes that it occurred on a not-that-unusual day in not-that-unusual circumstances. The slope had failed before, and the community had enacted mitigation efforts to protect the slope from further destabilizing. The hillside had previously been logged, but not since the 1950s. Most recently, they had even constructed berms to protect the toe from undercutting by the river. So, what happened? Tree growth from the previously-logged forest and changes in topography and subsurface compaction from the 2006 landslide were probably impacting the water flow in the region. But those are just contributing factors — why did the landslide happen on that exact day and time? Pinpointing a triggering event that sets off a landslide in critically unstable terrain is tricky, but the best guess for what triggered this landslide is rain. It was an average wet spring for the Pacific Northwest leading up to the event, although the three weeks immediately proceeding the failure were a bit rainier than usual. However, that rainfall wasn't outside the normal range of a rainy March, and that day wasn't spectacularly rainy compared to the rest of the month. There's no particular reason for why the landslide remobilized when it did as opposed to any other rainy day this year, last year, or next year. A slightly more useful outcome of the report is acknowledging that while landslide hazard is well-understood for the region, landslide risk was not communicated clearly. The hazard is the science, independent of people: how unstable is that slope, how likely is it to fail, how far will it run out when it does? While landslide hazard mapping is an active area of research, the hazard in the Oso region was fairly well-understood and mapped out. Where the science communication failure came into play is with applying that hazard to the people and objects vulnerable to it: understanding the risk to the community, and communicating the risk to policy makers. Unfortunately, trying to understand and communicate risk is tricky. Not only is risk a multifaceted concept where the physical hazard is not the only (or even necessarily primary) concern, but it also involves statistics. People are notoriously terrible at applying probabilities to their own lives, a problem compounded by misleading phrases like, "one-hundred year flood" or "storm of the century" conflating return periods with time. Addressing how to communicate risk effectively is a difficult challenge with no quick fix. Really large landslides like this one also enter into the realm of some very strange mechanics where they run out farther than we intuitively think they should. Instead of obeying a simple model like a block sliding down a slope, the dynamics of motion gets downright complicated for landslides over a million cubic meters. Consequently, what feels like a safe distance really isn't as the overly-mobile landslide can travel substantially farther than instinctively anticipated. A set of good analysis models can improve runout prediction and hazard mapping, but that's an expensive, specialized task complicated enough that I wrote a thesis on trying to simplify the problem. The community of Oso was concerned about the unstable slopes over half a century, with another batch of inspections after the 2006 Hazel Landslide threatened the town. The reports confirmed that the slopes were unstable, but that landslides would keep happening in a piecemeal fashion. Repeated small landslides aren't that terrifying for the town: small volumes slumping independently over a long period of time wouldn't make it across the river. The worst-case scenario was a small landslide blocking the river, flooding the town as water built up behind the temporary landslide dam. Instead, over 7 million cubic meters of material failed at the same time, producing a massive landslide well within the realm of strange mechanics that characterizes catastrophic landslides, and ran out far further than anticipated from simple models. This isn't anyone's fault: getting a full runout analysis for a every potentially threatening catastrophic-scale event in that valley would have been cost prohibitive even if they understood why it would be wise to commission that sort of assessment. Between the specialization of the task and the limited funding for landslide science within the US Geological Survey (USGS), it's just not feasible to assume every at-risk municipality will have the resources to acquire a detailed hazard maps for all the unstable slopes endangering the settlement. Even if they had a solid hazard map to reference, it's not clear that policy makers would know how to translate that hazard into a risk assessment for their community. It looks like the biggest lesson we can take from this catastrophe is that the scientists and engineers who consult on geohazards need to help policy makers understand how that hazard translates into risk. It'd also be beneficial if policy makers had a better grasp of the geoscience so they understood the difference between hazard and risk, and felt more confident when asking for help interpreting the risk posed to their communities. A disaster is never fun, but I find this landslide particularly heartbreaking because the community had genuinely attempted to mitigate their risk. They did the right thing by hiring geoscience consultants to survey the area, and thought they had done enough to mitigate the hazard. Although hindsight is amazing for pointing out all the warning signs that living at the base of a looming landslide is a bad idea, there was nothing noteworthy or unusual in the circumstances leading up to the catastrophe at Oso.